LTE discovery seems to not work well with AT&T on xt1058 (moto x 2013). It always says I'm on band 17. Is there any other app that has this function? If you want an alternative check out SignalCheck by BlueLineComputing (MikeJeep). He makes another great signal utility you might enjoy. Just look for SignalCheckLite in the Google Play Store. If you like it I'd recommend supporting him as a dev and purchasing the pro version. If you want an alternative check out SignalCheck by BlueLineComputing (MikeJeep). He makes another great signal utility you might enjoy. Just look for SignalProLite in the Google Play Store. If you like it I'd recommend supporting him as a dev and purchasing the pro version. Very nice, and very fair. There appears to be issues with the Nexus 7 LTE (2013), or at least when there's a Verizon SIM in it. It shows LTE signal strength properly but doesn't show the band and the SNR just says "N/A." Obviously the Nexus 7 is a bit unique when it comes to Verizon since it has no CDMA support and relies purely on the fact that VZW's network is pretty much 100% LTE at this point. Also, for what it's worth, Signal Check Pro seems to have the same problem. It seems that I am always on band 17! Weird. Thanks for your help! Hmmm there are a few API's we use that some phone manufacturers choose to not permit which cause issues like what you are describing, but I'd be pretty shocked if this were the case on a Nexus device (even if it is a tablet). Could you post a screenshot of the signals page for me to take a quick look at? I did a little more digging and it actually appears to be a radio issue. Here's what's weird. On every radio except the current one, the network identifies properly as "Verizon Wireless" and LTE Discovery shows the band I'm connected to, but still shows the SNR as "N/A." 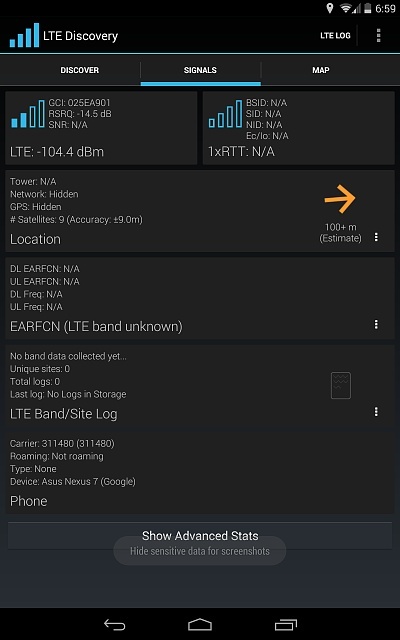 However, on the latest radio (which has appeared on every firmware since 4.4.2/KVT49L and is the one with "official" support for Verizon), the network identifier from Android shows 311480 (MCC-MNC of Verizon's LTE network) and LTE Discovery does not even show a line for "band," plus the SNR shows "N/A." Attached is a screenshot. Truthfully, I wouldn't worry about this as I think the latest radio is getting confused because of Verizon's multi-band LTE. I'm sure this will probably fix itself whenever Google and Asus decide to get the Lollipop update out there. Hmmm well the SNR is likely an API restriction that we can't get around, but I think we should be able to correct the band identification. I'm going to tinker around with some settings and hopefully it should be corrected in the next release. I use LTE Discovery app and I have the Pro Edition. Very useful app. Thank you! SUGGESTION: Have you ever considered creating a crowd sourced LTE bands coverage display map? For all carriers, but especially for AT&T. I've searched and cannot find one. IF there is one, please point me in that direction! A lot of people use prepaid carriers and BYOD. They need to know specific bands being used in their area. I use AT&T GoPhone, which only has native AT&T service, not roaming. I have the Moto XT1225, which is the "international" version of the Verizon Droid Turbo XT1254, and is basically the 5.2" version of the Moto Nexus 6. 5.2", 1440p, Snapdragon 805, 3GB RAM, 64GB storage, Qi wireless charging, Turbo charging. Rooted, TWRP recovery, 5.1.1 custom ROM. Actually, I own two and am running them both on AT&T network. It has LTE bands 2, 3, 4, 5, 7, 17, so I am lucky it has all the AT&T bands (2, 4, 5, 17). In Georgia, I find 2, 4, 17. But in other places, like Vermont AT&T uses LTE band 5 mostly. BUT, what about people who want to know AT&T LTE coverage in their area, specifically the bands being used? All the maps I find only show generic "LTE" or "4G" coverage. How would that help someone in Vermont that does not have a phone with LTE band 5? Current AT&T map or even Open Signal map would show "LTE" coverage, but when they BYOD their phone to AT&T prepaid service, suddenly they don't have LTE! Because all the maps do NOT show necessary information! Even new phones do not always have all the AT&T and T-mobile LTE bands, if you wish to switch carriers. I'll give you a specific example. A lot of people are buying phones like the Verizon Droid Turbo XT1254 (LTE bands 2, 4, 5, 13, 17) to use on AT&T and T-mobile. Well, you see the problem. It does not have LTE band 5 (AT&T) or new LTE band 12 (T-mobile). In some parts of the country, that wouldn't matter. In other parts of the country, it matters very much. A crowd-sourced LTE bands coverage map for carriers -- which your app could generate -- would be very useful! I think you could do much better! 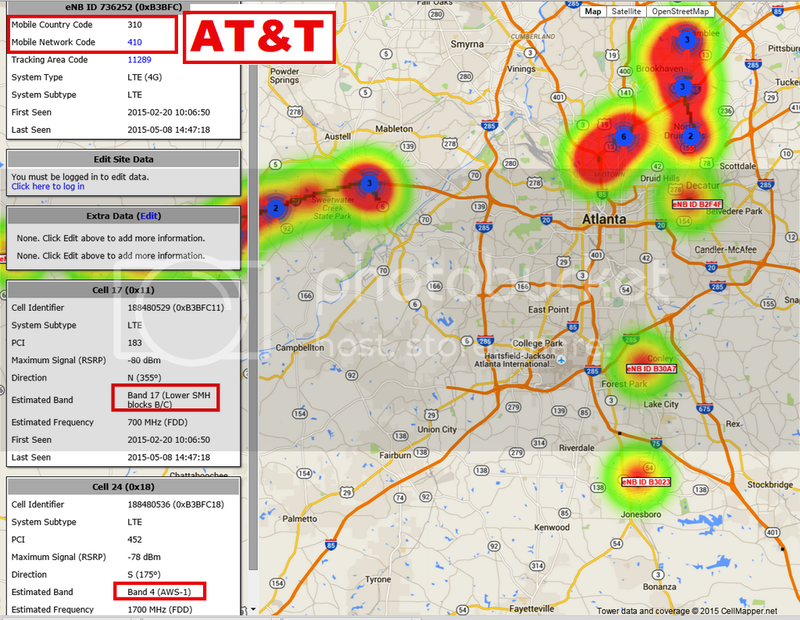 "Have you ever considered creating a crowd sourced LTE bands coverage display map? For all carriers, but especially for AT&T. I've searched and cannot find one. IF there is one, please point me in that direction!" 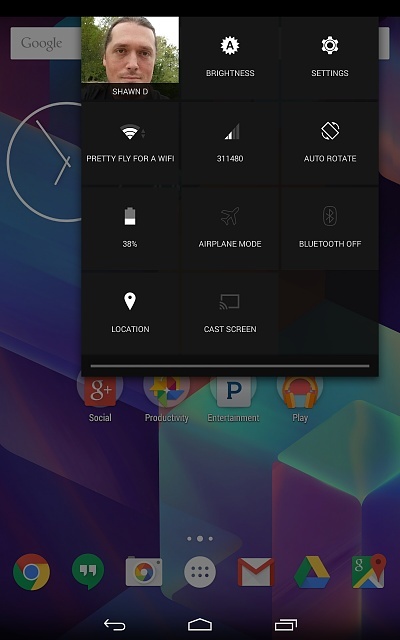 Triangle away doesn't work on 4.3 jellybean Galaxy S3?